Matt Sayer had a great article on why he’s a fan of the LEGO video games as a space (and money) saver over the real thing. Like him, I’m totally onboard with Traveller’s Tales’ series of licensed games. I’ve played at least some part of most of them, and own almost all of the ones released for consoles/PC. (If only I had infinite time to do nothing but finish all of the ones I already have...) I love some more than others (LEGO Star Wars III, for instance, and LEGO Rock Band, and most recently, LEGO Jurassic World left me wishing there was even more of it), but they’re all good fun. 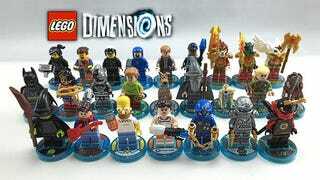 Anyway, I remember reading about LEGO Dimensions last year before it came out, and thinking “that sounds interesting” until I got to the part where I learned that you’d have to buy all the individual sets separately. I was like, no way am I gonna go down that route. I’ve watched friends go crazy trying to get Amiibos, and how many of the blasted things there are, and how hard they could be to get. My resolve was put to the test when told there would be a Portal 2 set, a Back to the Future set, and most tough, the Doctor Who set. But I held fast. I stayed strong. I would not sink outrageous amounts of money into this game! It would be a sacrifice, but I would spend that time working on the *rest* of my TT LEGO games backlog instead! And that was it. I was addicted sold. I started small; I asked for the various level packs and a couple key “fun packs” for Christmas. I got many of them, and picked up a few more when I found that the packs were all on sale (I even purchased a Best Buy Gamers Club Unlocked membership to get even more of a discount). You know. Just a few packs. I spent much time one weekend, and got through all but the Ghostbusters, Simpsons, and Back to the Future level packs. I was making progress! This was good! I was filling only a little tub with the characters! And then a few weeks ago, the most recent sale hit. This time, I used some gift cards from Christmas. And I got a few more. Just... you know, a few. Yeah, I went and bought the rest of the ones I didn’t have yet. I did manage to get through the Ghostbusters level pack. But I still need to go through all these. And finish the regular part of the game.